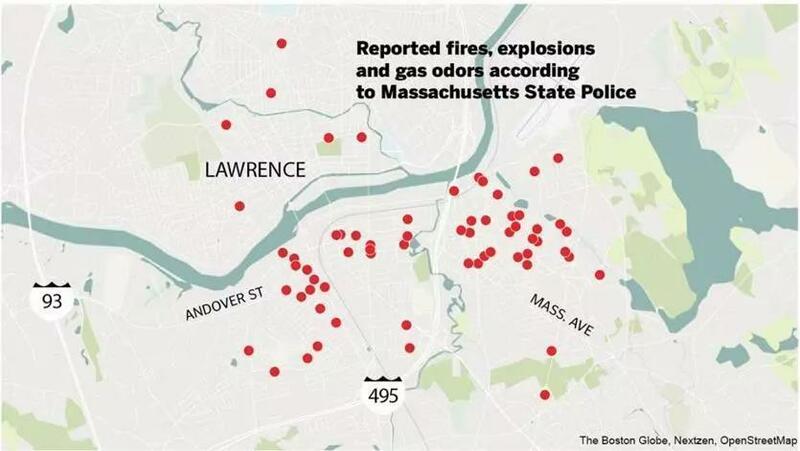 LAWRENCE — More than 60 fires and at least three gas explosions rocked Lawrence, North Andover, and Andover in a staccato burst of flame and fear late Thursday afternoon, damaging scores of buildings and prompting mass evacuations from homes served by Columbia Gas. State and local emergency workers descended quickly on the three Merrimack Valley communities, knocking down the fires, tending to the injured, and working through the night to inspect and shut off 8,000 gas meters. A Lawrence man died, and at least 25 others were injured in the fires, officials said. 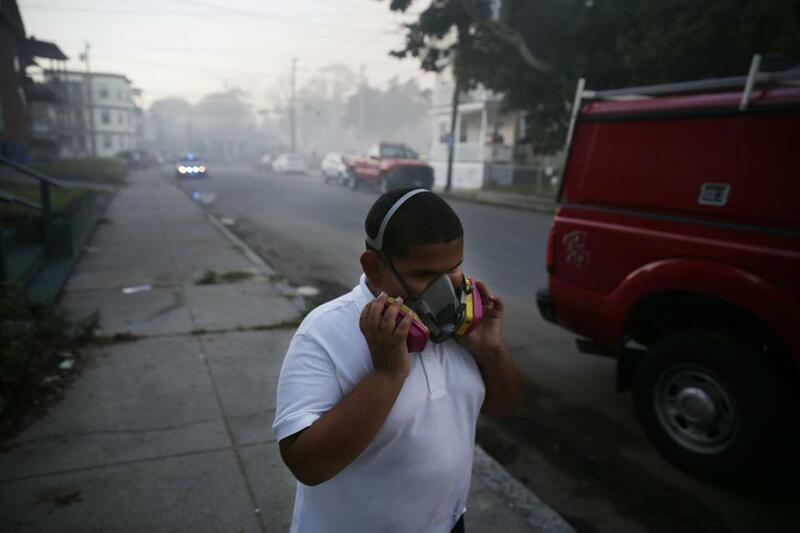 Leonel Rondon, 18, had been sitting inside a car when an explosion in Lawrence caused a chimney to fall on the vehicle, according to the Essex district attorney’s office. A spokeswoman for the state fire marshal’s office said investigators are focusing on overpressurization of a gas main owned by Columbia Gas, which serves about 50,000 customers in and around Lawrence and had been upgrading its equipment in the area. “This is like Armageddon,” said Garry Frizzell, 51, of North Andover, as he watched emergency vehicles roar past his house toward two nearby fires. Follow reporters on the ground. Frizzell said he had smelled gas in his house at 4:45 p.m. “I said, ‘I left the stove on’ — then I realized I hadn’t used it in three days,” he said. Nearby, one man ran from house to house shutting off gas mains. The house explosions and fires started about 4:30 p.m., erupting sporadically as firefighters responded to them for more than three hours in the three communities. National Grid, which provides electricity to the area, turned off power to its customers in the affected area, said National Grid spokeswoman Christine Milligan. Nearly 18,000 National Grid customers in the three communities were without power as of 3 a.m., according to the Massachusetts Emergency Management Agency. After the conflagrations began, Lawrence Mayor Dan Rivera asked all residents of South Lawrence to evacuate their homes. The power outages gave that part of the city an eerie vibe Thursday night. Homes, fast food restaurants, gas stations, traffic lights — all were dark. Officials directed traffic at some intersections with flashlights. Multiple streets were closed to vehicles. “This has obviously been an incredibly difficult day,” said Governor Charlie Baker at a news conference held at the impromptu emergency operations center in a Lawrence parking lot. Baker said he was “especially heartbroken” to learn of Rondon’s death. “I ask everyone to think of the family who lost a loved one today and to pray for everyone who’s been injured,” he said. Rivera, for his part, said the firefighters who responded to Thursday’s blazes were tired. “They fought a lot of fires today,” said Rivera after midnight. He also worked to assure those who were evacuated from south Lawrence that their homes would be kept safe. The police presence in that part of the city Thursday night was heavy and noticeable. Cruisers patrolled the thickly settled neighborhoods slowly with their blue lights flashing. Officials detailed a massive undertaking as public safety workers checked for gas and shut off mains. Andover Town Manager Andrew P. Flanagan, said only part of the town needed to remain evacuated and for those in the area affected, teams of firefighters, police, and a natural gas technician were going to door-to-door to confirm the gas was turned off. “If it has not been shut off, it will be shut off,” he said. William Hartung, a 49-year-old subcontractor, said Thursday evening was hectic in South Lawrence. Many people were in front of their homes, confused, he said. Traffic was snarled. Streets were shut down. There was a heavy police presence directing people where to go, he said. “It felt like martial law,” he said. Boston police planned to send 40 officers to the communities “to provide whatever assistance is required or needed to help restore calm and keep people safe,” said Officer James Kenneally, a department spokesman. Streets bordered by flames soon were covered in a tangle of water hoses from fire equipment rushed to the scene from dozens of communities in Massachusetts and New Hampshire. State Police converged on the area, as did scores of local safety personnel. Bewildered and sometimes-panicked residents, responding to shouts from police and fire officials to leave their homes, poured into the streets, asking friends and strangers for scraps of information. At one point in Andover there were said to be 18 fires burning at once. The Andover Senior Center and Youth Center were opened for displaced residents. Other shelters were opened in Lawrence and North Andover. Public schools in Andover, North Andover, and Lawrence will be closed on Friday, according to postings on their home pages. As dusk fell Thursday, residents gathered at North Andover High School. Some called family. Others calmed children. And just about everyone was exchanging information — how many fires and where? “Have you heard anything?” was the common question. People also told their stories. “I was cooking in the house around 4:15 or so, and my stove went out,” recalled Terry Dunlavey of North Andover. She said she called her landlady and soon found out what was happening, as she heard sirens. “It was chaos, absolute chaos,” said Dunlavey, who added that she was thinking about victims. “If anyone prays, pray,” she said. Columbia Gas began cutting off service after the explosions. The utility is part of NiSource, one of the largest fully regulated utility companies in the country, with approximately 3.5 million natural gas customers and 500,000 electric customers, according to the company’s website. Nisource stock was down as much as 10 percent in premarket trading. A press release published Thursday on Columbia Gas’s website announced work to upgrade natural gas lines and improve service, including four ongoing projects in Andover, three in Lawrence, and two in North Andover. James Cohne and Jack Ventre, both 11, were returning from playing in a park in Lawrence when they saw a house smoking on Green Street, next door to Cohne’s house. The boys ran inside and called for help. Elsewhere in Lawrence, a fire had flattened a home on Jefferson Street, and a team of firefighters worked into the night to make sure it was under control. Some of them stood on a brick staircase leading up to where the front door should have been. A blackened wall hung crazily on one side. On Friday morning, even as gas mains were still being shut off house by house, federal officials who will help take the lead in the investigation of the explosions and fires were already on the ground with others en route Massachusetts. Kurt N. Schwartz, who leads the Massachusetts Emergency Management Agency, told reporters some officials from the Pipeline and Hazardous Materials Safety Administration were already in Massachusetts with more coming in the overnight hours. And a team from the National Transportation Safety Board, which also has jurisdiction, would be in Massachusetts soon. Those two agencies will take the lead in the federal investigation of gas troubles, he said. On the state side, Schwartz indicated the Department of Public Utilities and the emergency management agency he leads would be involved with figuring out what went wrong in Lawrence, North Andover, and Andover. 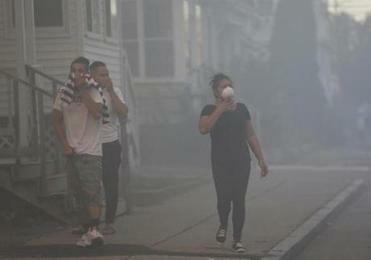 A boy used a mask to protect himself from heavy smoke from a fire on Bowdoin Street in Lawrence. John R. Ellement and Andy Rosen of the Globe staff and Globe correspondents Abigail Feldman and Alyssa Meyers contributed to this report.